The interactive song lessons on this extremely comprehensive DVD disc represent a cross-section of modern guitar styles and song forms. The split-screen footage, multiple camera angles and incredible close-ups let you watch Jim Kelly's hands to learn his secrets, tips and tricks as he presents each tune as a full performance followed by a special teaching section. He plays in the style of guitar greats like Jeff Beck, Wes Montgomery, Stevie Ray Vaughan, Joe Pass, Pat Metheny and more. 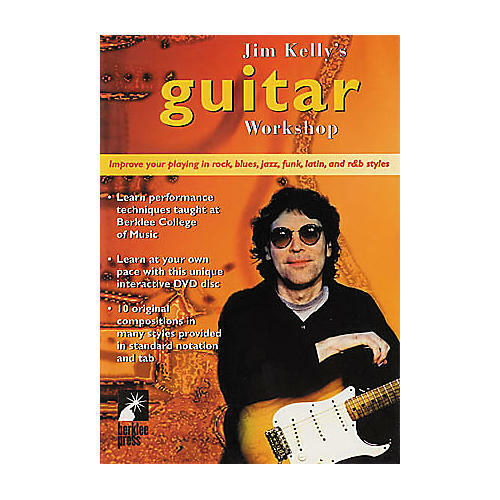 With over 90 minutes of guitar performance and instruction, an accompanying booklet with standard notation & TAB, and lessons in English, Japanese and Spanish, Jim Kelly's Guitar Workshop DVD lets everyone have fun and improve their playing at their own pace. 90+ minutes.